Lee Pace | What is Ann Watching? It is that time of year again. Yes, of course I mean the time to revisit Middle Earth in the 2nd of 3 instalments of the Hobbit movies. I went to the theatre to see it in 3D (would have preferred 2D but the show times were not in our favour) with my husband (big fan of Tolkien’s Middle Earth), my eldest daughter and her friend. My youngest made it clear that she was not interested, after having watched the first instalment. She was happy to visit with friends instead. I had mixed feelings going in. I have no particular affection or nostalgia for Middle Earth. I felt the first movie was bloated so I was prepared for the worst. However, I am fond of some of the actors (Ian McKellan, Richard Armitage, Martin Freeman, Aidan Turner, Dean O’Gorman, Lee Pace and Benedict Cumberbatch) and I think Peter Jackson is a visual genius. BUT this is essentially a road movie with very little character development. Yet it has a large, mostly neglected, ensemble cast. The perils encountered along the journey held my interest to varying degrees but few were memorable beyond the moment – except perhaps the barrel escape. When the company gets separated, the movie switches clumsily between Gandalf’s solo (?pointless) side quest and the company of 13 Dwarves + 1 Hobbit. I enjoy road movies if there is character development as well as colourful or funny encounters. Sigh, this film had none of this. It felt like endless action sequences stitched to boring expository scenes. Oh yes, I almost forgot, there is a terribly shoehorned love triangle (Legolas, Tauriel, Fili). That was not enough to have me invested in the fate of any of the characters. To make matters worse, the movie ends on a complete cliff hanger. “Quelle surprise” its the middle of a trilogy. You would think that after watching this group on their quest for 5+ hours and over 2 films, I should care about their fates. I — so —- really —- don’t. Regardless, I will be back for the last instalment in approximately 1 years time. Why not skip it? It is visually stunning and because my daughter and husband really liked this movie. So I don’t mind spending a bit more time with them in the company of Ian McKellan, Richard Armitage, Martin Freeman, Aidan Turner, Dean O’Gorman, Lee Pace and Benedict Cumberbatch. Hopefully in 2D, as 3D was completely unnecessary. This remains a movie for fans of Tolkien who want to spend as much time in Middle Earth as possible. Alas, that is not me. My husband has been itching to see this movie for weeks now and in anticipation, the whole family got ready for the event by re-watching all 3 extended installments of the Lord of the Rings. They hold up well and it was an enjoyable jaunt. My husband is a huge fan of the books, ever since childhood. Me, not so much, I read them all as a young adult. The Hobbit, was an enjoyable read but it did not resonate in any special way. The Lord of the Rings trilogy, UGH, was a slog of a read. I finished it but felt that I was reading another language. I hate reading long descriptive dialogue free verse. Clearly these books were not made for me and left me feeling stupid and inadequate. That was over 20 years ago, and revisiting the books is on my bucket list. Perhaps I was just too immature at the time I read them. As for the movie adaptations, they were enjoyable enough but rather long and dragged at times. A considerable amount of eye candy (Viggo Mortensen as Aragorn) definitely helped buoy me through a 9 hour road movie. When I heard that Peter Jackson was turning The Hobbit into 3 films, I immediately thought, “what a money grab.” Certainly, economies of scale from microeconomics 101 taught me this. But clearly the die-hard Tolkien fans don’t mind spending as much time in Middle Earth as possible. Unfortunately, I am simply a casual fan, as is my youngest daughter. I struggled through the 1st part of the film (we saw it in 2D , all 2h40mins of it) placating my youngest daughter as she grumbled “Mommy, this movie is boring, I want to leave.” She settled when she realized that hers was a very privileged problem and that I was not going to bail and the story started to pick up (when the group ran into the trolls). 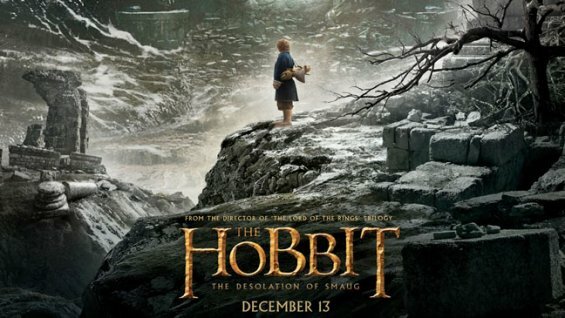 This film is a prequel to the LOTR and deals with Bilbo Baggins’ (Martin Freeman) adventures with Gandalf (Ian McLellan) as they assist a group of displaced dwarves in a quest to recapture their homeland from the conquering dragon Smaug. It too is a road movie with many adventures and battles along the way; all of which are done with imaginative skill and a dose of humour. My biggest complaint is how it takes its sweet time hitting the road. The first half of the movie really drags. This could have been a single film. It was overindulged and poorly paced. I will not start picking at plot holes (of which there are many – “wait eagle, thanks for rescuing us from a certain death but why did you drop us off on this mountain when we clearly want to go to that mountain, way off in the distance, come back, come back”). It is beautifully filmed and well acted. Also in the plus column, this film has many performers that I have fondness for (Richard Armitage as Thorin, the dwarf king; Aidan Turner as the hottest dwarf, Kili; Lee Pace as Thranduil, Elvenking, Martin Freeman), not the least is creepy old Gollum. The end of the film, of course is abrupt, as there are 2 more films to follow in completion of the tale. At least we got to see Bilbo’s acquisition of the “precious” ring. So overall I enjoyed myself, as did my husband and eldest daughter. Stretching this 279 page children’s novel to trilogy of films still feels like money grab to me, a casual fan. But perhaps, I am biased because as a rule, I don’t care for multi-part movies that make me wait a year between installments (Kill Bill, Pirates of the Caribbean II & III). I would just as soon wait for a marathon viewing at home on DVD. But this film was not made for me; it was made for the die-hard fan of Middle Earth, of which my husband would qualify. The slow start to this film failed to win me over to that camp. My youngest daughter was begging not to be dragged to the next installment. I hope her mind will change because I know my husband and eldest daughter will want to go. I do not want to be left out of a shared experience, which always makes a film more enjoyable to me. Oh well, maybe I will pull the book off my daughter’s bookcase and return to Middle Earth, if only to refresh my memory on the ending.